Another cocktail mostly verbatim from Judge Jr.’s “Here’s How!”. The note in “Here’s How!” goes on to say, “Contributed by Owen Hutchinson and it explains why Cuba is a free country.” I’ve really no idea what that means. 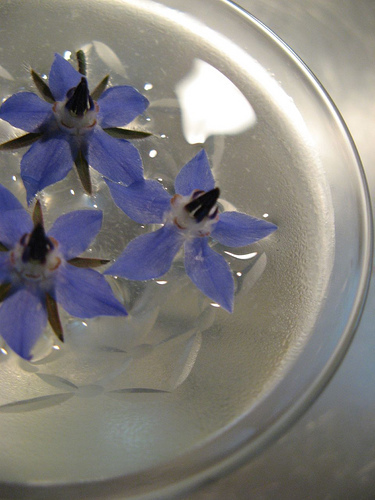 Picked some borage blossoms while at the garden today for garnish. Cool, eh? They have a slight cucumber-ish flavor when consumed. Went well with the drink. Yes, well, again, I am not sure what might be meant by “crushed chocolate”. I couldn’t imagine how crushing a chocolate bar would result in anything except a mess. Extra equipment: 2 small bowls, rubber spatula, and a whisk or fork. Dump a generous teaspoon of unsweetened Cocoa Power into one of your bowls. Add a teaspoon of water and mix until it starts to form a paste. Add a little more water at a time and continue mixing until it reaches the consistency of melted chocolate. Separate the white from the egg and whisk the yolk into the chocolate. 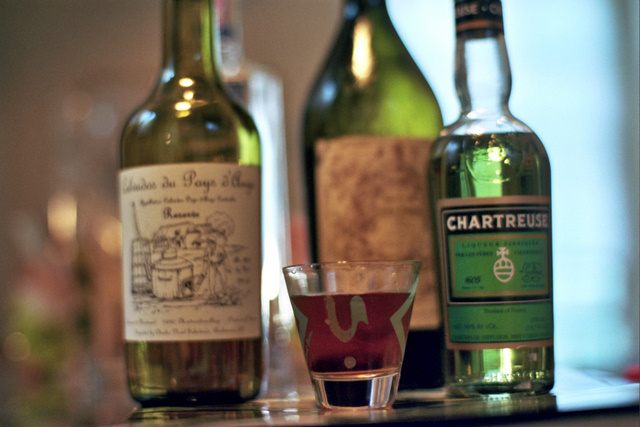 Measure the liqueurs into your mixing tin or glass. Pour in the egg and chocolate mixture. Add ice and shake well. Strain into cocktail glass. Unfortunately, they don’t really seem like, “two great tastes that taste great together,” at least in a cocktail. I dunno, maybe white or tawny port would work better. As usual with these 6 person cocktails, I’m using 2 oz per “Glass” and dividing it in half to make two drinks. Might be my favorite Chartreuse cocktail so far. Perhaps related to the pleasant pale green color and dry, tart flavor. Quite herb-a-licious. I didn’t really feel a need for extra sweetener, despite the fact that the recipe calls for it. As they say, your mileage may vary. I do find this same cocktail is sometimes called the “Bitter Cocktail” in some sources. Might be another Savoy typo. Mix well with a spoon in a large bar glass; strain into a cocktail glass, add a cherry or an olive, squeeze a piece of lemon peel on top and serve. The Bijou had been on my list of cocktails to try for a while. It’s always exciting to get to a Savoy cocktail I actually want to make! So I won’t bore you by repeating his conclusions, just check out the article. I do kind of go back and forth on the ratios for this cocktail. The equal parts version above is pretty sweet and rich. Sometimes I just don’t quite feel like that much Green Chartreuse and Sweet Vermouth, so I’ll up the gin a bit and dial those two back. Changing the recipe to something like an ounce and a half of gin and 1/2 ounce each of Sweet Vermouth and Green Chartreuse can transform this into more of an aperitif rather than digestiv cocktail. 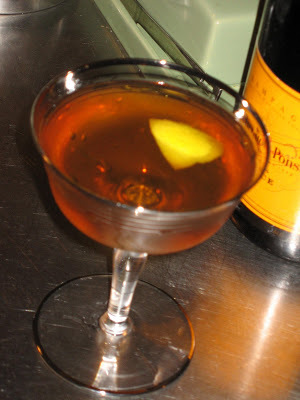 Anyway, whichever way you slice it, the Bijou Cocktail is a true classic. 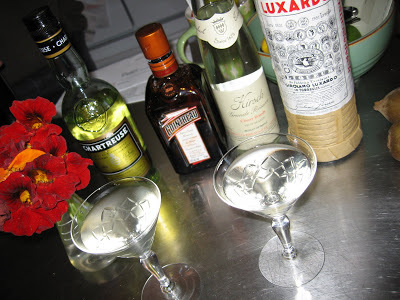 In older cocktail books there are many cocktails for 4-6 people. I guess these are intended for dinner parties and the like. In “The Savoy Cocktail Book” these are almost always measured using the “glass” measure. In the parlance of late 19th and early 20th century cocktail bar the “glass” or “wineglass” amounted to approximately 2 ounces. So, if Mrs. Underhill is interested, I’ll just use the number of “glasses” as ounces, effectively cutting the recipe in half, making 3 small or two medium drinks. If my wife isn’t interested, I’ll half it again, and turn it into a “large” single serving. But, really, again the drinks back then were not very large. This one is especially illustrative as the math is easy. You’ve got 6 glasses or 12 oz of total liquid. That’s a 2 oz cocktail per person before dilution. After shaking or stirring with ice, it is probably 2 1/2 or 3 oz per person. Not a large drink at all. 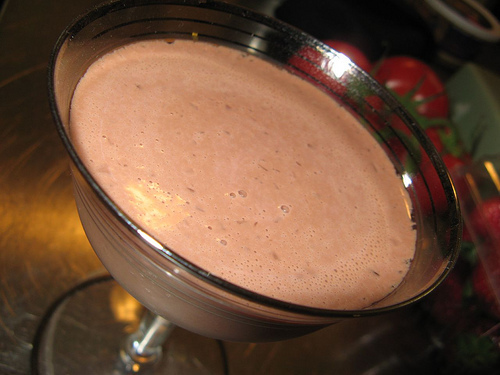 Shake (Stir please – eje) well and strain into cocktail glass. I think the size is about right for 2 as an after dinner cocktail. Complex and more palatable than I imagined, given the amount of liqueur. Still, very sweet! I found it much improved with a squeeze of orange peel over the top. 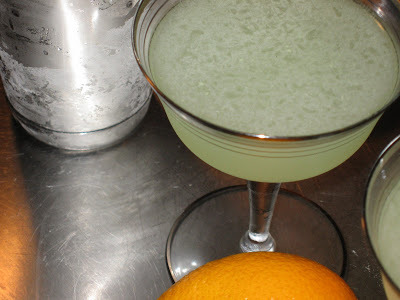 I couldn’t really find a definitive answer in regards to the type of Chartreuse in this cocktail, yellow or green. I found different recipes calling for either one. Another contemporary guide with “The Savoy Cocktail Book,” Patrick Gavin Duffy’s “Official Mixer’s Manual” calls for yellow, so I went with that. Green Chartreuse would be interesting; but, as it is even higher proof than the yellow, it would put this cocktail in the dangerous to consume range.